The jungle hills outside of Caracas, Venezuela are home to a savage bio diversity including wild parrots, howling monkeys and stealthy jaguars. Jonathan Franklin went to investigate the most dangerous species of all – the teenage hitman. For one mad weekend, Franklin went camping with a group of six teenage hitmen armed only with his video camera. The killers left their guns behind and brought a wealth of stories. At night they sang rap songs and cried about their crimes. By day they plotted new savage attacks and fought, as one killer tried to chop off his mate’s head with a machete. I am camping with killers. 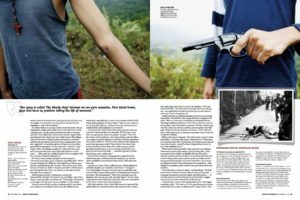 We are high in the Venezuelan hills, amidst a thick green jungle, three tents packed with some of South America’s most vicious criminals. They kill for a motorcycle, kill for a pair of sneakers, kill for fun. Now they are on the run from the police, from rival gang, trying to escape their bloody destiny. In total they are six teenagers, young thugs, lost souls. Between them they have murdered approximately 50 people, but no one here bothered to keep track. We arrive by night, a jeep brings us here– bouncing wildly – up a steep, red dirt track. We cross a rum plantation and drive straight across the sugar cane fields and then up, round and round the mountain until the lights of the town and highway traffic fade into thebackground. Up here the loudest noise is the parrots yakking or the gangsters clanging machetes as they joust and duel at this remote jungle campsite. No one can sleep. So, the gang lights up a bonfire. Rival gangs prowl the lower edges of this mountain. 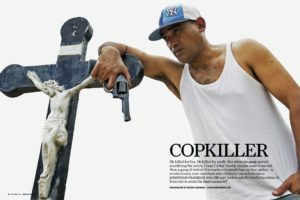 The police search with dogs and jeeps, not to arrest the gang but to execute them – Venezuelan police tend to leave more work for the coroner than the judge. Recent shootouts have left dead on both sides. A rival gang has a price on their heads – 5,000 bolivars each (NZ$1,720). The police hand out pistols to the gang’s enemies with simple instructions: Take this gun. Kill one and keep the gun – as payment. Even their own neighbors have hired sicarios (trained assassins) to eliminate the plague from the ‘hood. “There used to be 40 of us (in the gang) but now there are only 16,” explains Javier Ochoa, 20, a big smile accompanying a calm. “The rest are dead.” On average these teenagers have killed 3 to 5 people – each. Dozens more have been wounded. These young men have organized dozens of robberies and carjacking. They are also delivery boys, delivering “mensajes” (messages), which is a delicate way to describe having your buddies hold a guy’s hand down, so you can shoot 2 or 3 “messages” out the other side. Killing is what they do when they don’t have time to torture. As we eat breakfast, each gang member confesses his crimes, murder by murder, robbery by robbery – each has his specialty. Lllanero, for example, is the shock troop. Skinny like a war refuge, long gangly arms, he has no problem pulling the trigger on a witness to the crime. During a robbery siege, Lllanero stands off center stage – ready to shoot at the first problem. 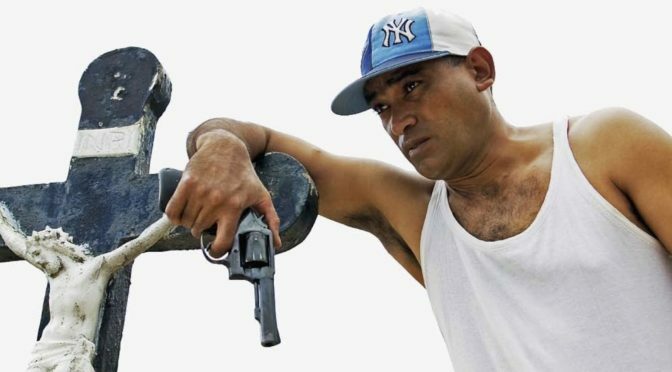 Despite his colleagues mockery, Llanero insists he has killed no one – “I just shoot them in the arms or make their legs explode,” he says of robbery victims or rival gang bangers. Llanero describes firing 9mm rounds into the thigh of an enemy as if he were collecting points on a video game. “I am a knife man-” he holds out his palms, to show off bumpy white battle scars. These young gangsters described treating bullet like personnel from an urban hospital’s emergency room– they spent entire conversations describing a step by step home remedy for bullet wounds: clean it with warm water, get the “bad blood” out, don’t let it scab over. “If the bad blood gets clots, you get gangrene and goodbye leg,” said Llanero casually as if he were describing a scraped knee after a bike accident. At first glance Vollmer’s project sounds like Mission Impossible – turn hitmen into community leaders? Even Presidente Hugo Chavez’s romantic notions of socialist utopia have rarely stretched so far. 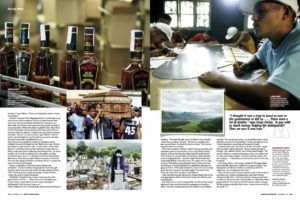 But Vollmer’s dream is rooted in a set of basic principles that are displayed every day on the sprawling rum plantation where Alcatraz is headquartered. Here in the palm-studded fields, just a short drive from the picture perfect Caribbean coastline, Vollmer and his staff have created a refuge for these young adolescent killers. “We send the kids to the kills for a week, they are alone. We have a counselor who goes up and down but they are alone. They have to organize their own society, like the Lord of the Flies as the street leaders are overtaken by new leaders who can best figure out the new system. Alternative crime fighting measures like Project Alcatraz have gained popularity as the murder rate rise sharply in Venezuela and public institutions like courts and prisons are swamped. Crime rates are soaring in Venezuela with an estimated 15,000-18,000 murders last year. 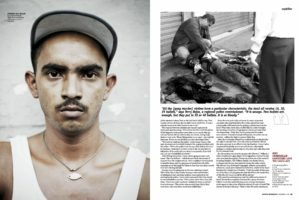 Foreign Policy magazine dubbed Caracas “Murder Capital of the World” in Given the recent surge in crime the Chavez government has made it difficult for reporters to access true crime and violent death figures. While reporting this story, this reporter was repeatedly banned from interviewing doctors, cemetery officials and police. On two occasions police detained me for the offense of asking about crime figures. “We are not allowed to let you in,” said security guards at a public hospital in Caracas. According to the non profit Venezuelan Prison Observer, Venezuela has a capacity of 12,500 inmates but recent statistics show that 32,000 prisoners are being held. Human Rights Watch has regularly condemned the Venezuelan prison system as one of the most violent in Latin America, the massive overcrowding leads to more violence, with an estimated 1,300 prisoners killed during the past three years. Living with a half dozen hitmen for the weekend is something you do not easily forget. Surprises abounded, like the fact that the killers were excellent cooks and my morning memories are the “whap, whap, whap” of fresh dough being molded into breakfast arepas. Or the fact that the killers had no problem standing in front of my video camera and confessing for hour after hour to their crime sprees – ranging from a taxi driver they murdered (“We didn’t have the money to pay him”) to professional hits paid up front with getaway driver arranged. 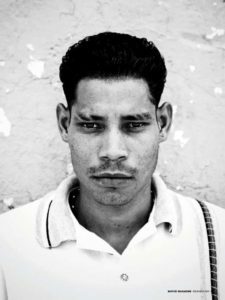 Ramon rattles off the names of his dead friends like he was drawing up the list for his birthday party party – friends and family, except that he will never see any of them ever again. Death in this corner of Venezuela comes with the ease and frequency of birth.